Things have been crazy around here lately and cooking has taken the back burner. Instead of trying new recipes I've been pulling out old family favorites. 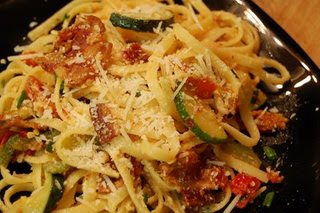 The Linguine Non-Carbonara recipe, originally from Blue Kitchen made a quick meal on a hot evening and used up some of that locally-grown produce I picked up at the Farmer's Market. In a big, deep skillet, saute the bacon until the fat has mostly been rendered out. For this recipe, the bacon is best on the crisp side. Set it aside on paper towels to drain. Pour most of the bacon fat off. Meanwhile, start a pot of water. When the water comes to a rolling boil, add the linguine, stir to make sure it is all submerged and separated, and cook to al dente. Add 2 tablespoons olive oil to the pan. Heat it, to moderate, then add in all the bell pepper slices, toss to coat with the cooking fat, and sauté until the pepper begins to brown slightly. Remove the peppers from the pan. Lay the zucchini coins in the pan and sauté gently, turning them as they brown on one side, to brown both sides. When they are cooked, remove them from the pan. When the pasta has cooked to al dente, drain it and rinse it thoroughly with hot water. Let it stand in the colander, draining, as you finish the ingredients. Next, toss the chopped shallots into the moderately hot oil. Cook, stirring, for about 90 seconds. If you want to include garlic, cook it along with the shallots. Now comes the grand assembly. Return the peppers and zucchini coins to the pan and let them heat through. Add the bacon back to the pan and, if you want to use chopped fresh tomato, add it now. Heat everything through. Then, working quickly, add in the cooked pasta all at once. Toss the pasta and vegetables thoroughly, so that the pasta is well coated. When the pasta is gently heated through, pour the beaten egg over it and quickly, gently incorporate it throughout the pasta, stirring and lifting. The idea is not to create scrambled egg lumps but to let the egg and oil emulsify together. Scatter most of the scallion slices over everything and toss lightly. Working quickly, grate a cloud of Parmesan over everything—you want to add at least a half cup of Parmesan—and then add a good grinding of black pepper. Toss one more time to incorporate them throughout. How can you go wrong with bacon? Looks delicious, and I love the fresh summer produce in the dish! Mmm, that looks absolutely delicious. Wow! Well, I am down for anything that starts with a pound of bacon.